YAY i'm so excited it's nearly Christmas. For the past two days I have been in the most Christmassy mood which has resulted in a bit of a bashing to the bank balance. Think fleeces, pillows, reindeers, fairy lights, candles and socks. All Christmas themed. (If you follow me on Instagram you'll know what I mean). Over the years excitement for Christmas decreases slightly but this year it is back and I've gone a bit mad. Possibly due to the fact I have a 5 year old sister, possibly due to blogs/instagram/pinterest/weheartit. 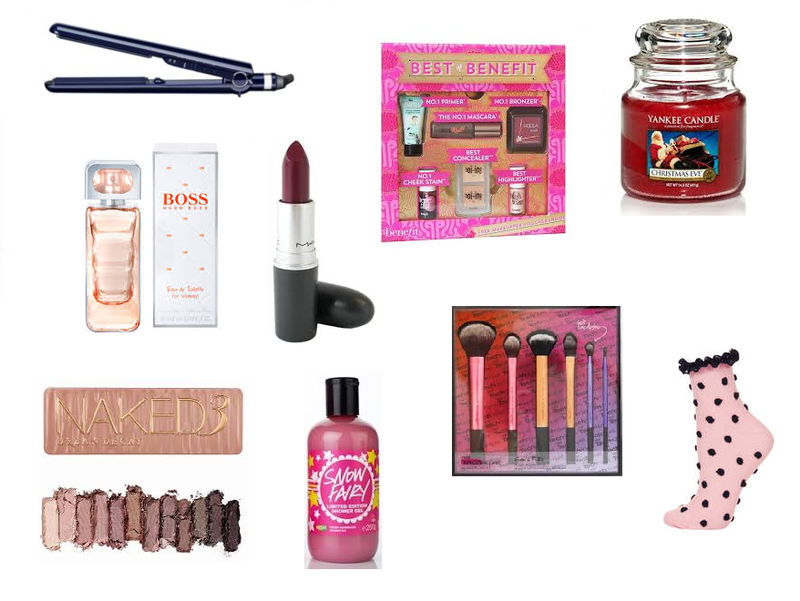 So here we are with my first Christmas post this year, my wishlist. There isn't anything in particular I need this year, but being a beauty blogger I always have a list of products I want to try. I've therefore made it into a blog post so you can further grow your own wishlists and spend more money you don't need to. Aren't I nice. I actually cracked my straighteners by standing on them, so whilst they do still work, getting my hair caught in the cracks is not all that enjoyable. I don't see the hype over GHDs and I know a few people with Babyliss straighteners and they really are great. I think the Best of Benefit set speaks for itself, a box full of my favourite Benefit products, yes please. Candles are always a must have in the winter time for getting cosy in bed and Yankee candles are well known for being amazing, only problem being that there are so many scents I can't choose! I used to wear Hugo Boss 'Boss Orange' a couple of years ago and when it ran out I decided to try soemthing new. I've been debating repurchasing it ever since and I just don't know why I haven't because I just need it now. Macs 'dark side' lipstick has been circulating the blogging world for a while now and I think it's gorgeous and perfect for winter so that obviously means I need it. My favourite face brush is definitely, definitely the real techniques buffing brush but mine has taken a bit of a bashing and I need a new one. You can only get this brush in the core collection set but I don't want the rest of that set, however this set looks much more appealing. Snow fairy shower gel smells absolutely divine, my mum thinks it's horribly sweet but I think it's amazing and if it was out all year I would totally have it all year. I would love anything from the Lush Christmas collection, it's all amazing! Last but not least, socks. These socks represent socks in general, I love cute socks, frilly ones, dotty ones, Christmas ones, printed ones. A lovely little stocking filler. And that concludes my 2013 Christmas wishlist! I've got even more excited typing this up and now I'm going to go to my newly Christmas themed bed, put on the fairy lights and watch The Grinch. I'm hoping to do some more Christmas posts, maybe gift guides and maybe a Christmas haul if you'd like to see all the things I've bought. What's your favourite thing from my wishlist? Are you as excited as I am? PS: I'd love it if you took a look at my new Instagram, either search emilykebeauty or click the link on the side of my blog. I havn't had it too long so I'm in need of people to follow, leave your links below and I'll check them out! Love Yankee Candles at Christmas, I'm currently burning Winter Wonderland, smells so nice! Love your picks, Snow Fairy smells absolutely gorgeous!